Black Frill Hem Leather Look Dress, £69. Ok, so we know that summer is the season when you’re supposed to embrace bold colours and bright white with the same gusto you would a chilled Aperol Spritz, but what if you just really love wearing black? Well, that’s totally OK too. While it may not exactly scream summer, making black a regular fixture in your warm weather wardrobe actually makes perfect sense. Black Lace Bardot Top, £35 and Black Lace Shift Dress, £69. Look for soft jersey, semi-sheer or looser fit cotton tops, skirts and dresses to avoid over-heating. An off-the-shoulder Bardot is the ultimate wear with anything piece. Anna Wintour and a fellow street style star pair black tops with bold printed skirts. Black separates are the perfect foil for more statement printed pieces. Channel Anna Wintour by pairing our ruffled one-shoulder top with our tropical printed skirt. Our black tops look great paired with bold prints. Fashionista Sarah Rutson nails summer black in a chic sleeveless dress. Going sleeve free instantly makes the cult LBD summer-friendly. From the office to holiday and special occasions, we’ve got one to wear everywhere. Offset yours with luxe gold accessories. Black Bandeau Dress, £59, Black Belted Dress, £69. 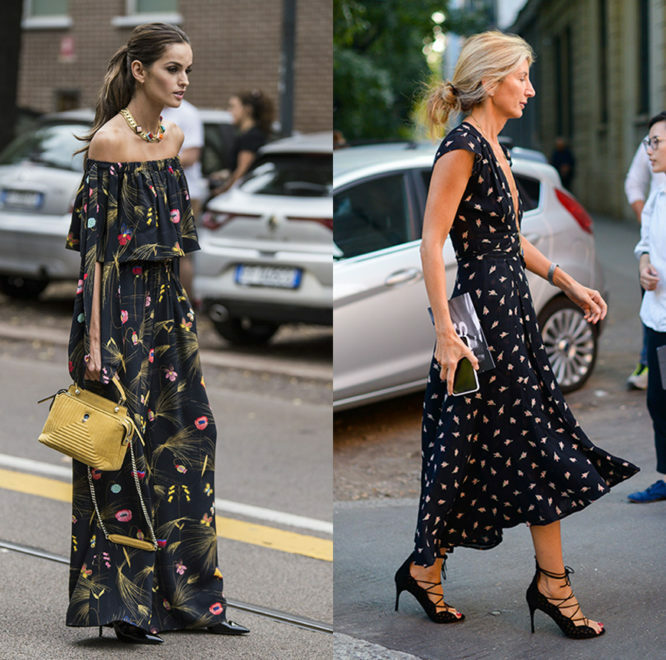 Supermodel Izabel Goulart and a street styler wear black printed dresses. A black background tempers prints perfectly – think of it as the sophisticated way to do summer pattern. If in doubt, go monochrome. Extra points for Bardot necklines. Monochrome Printed Maxi Dress, £59, Ditsy Floral Bardot Dress, £59. One Shoulder Ruffle Trim Top, was £29, now £14.50. The key with summer black is to keep it interesting. Think double strap tops, Bardot necks, one-shoulders and on-trend ruffles. Unusual shapes create a stand-out silhouette. Bardot Top, £49, Ruffle Hem Skirt, £39. 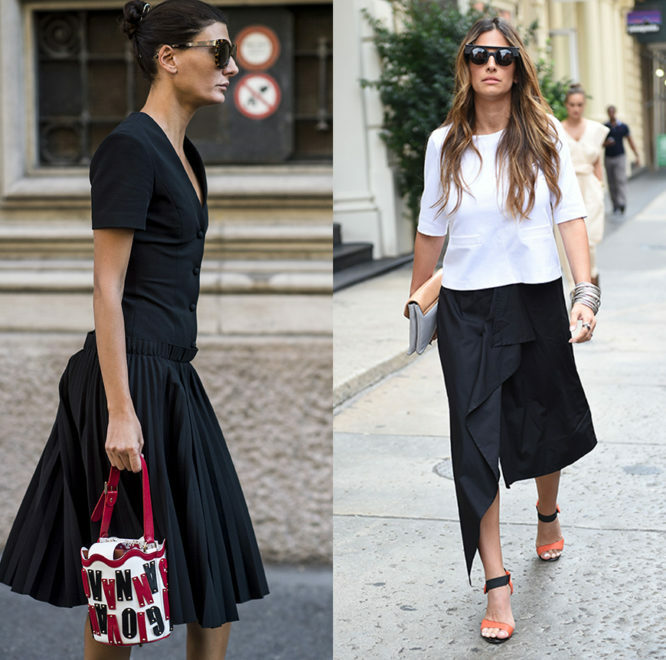 Fashion Editor Giovanna Battaglia and a street styler pair their black looks with bright accessories. Bright accessories will pop against black pieces, and you don’t need us to tell you that black looks bloody amazing with a tan. Go for bandeau dresses, midi skirts, and sleeveless tops to show yours off. Not jetting off? Just hit the (fake tan) bottle.